In Mailfed, you can insert dynamic contents to individual emails to make them personalized. It’s highly recommended to use as mush dynamic values as possible on your campaigns. There are basically 2 types of dynamic tags – common tags and custom tags. Common tags are the ones already available in system. Example : [WEB_VERSION_URL] , [FORWARD_FRIEND_URL] , [UNSUBSCRIBE_URL] etc. Custom tags are the ones created by the customer either specific to a list or global to all the lists owned by him. Global tags can be created under Dashboard > Campaigns > Custom tags. The ones which are specific to the lists can be created/found under Dashboard > Lists > Lists > click the pencil/update button on your list > Quick links > List custom fields. There you can see a “Tag” field corresponding to every data field. Now, on your template, you can call the custom field/tag value as [TAGNAME] and which will be replaced with corresponding values on every email based on the subscribers. In the case of global custom tags, you would call it as [CCT_TAGNEM]. 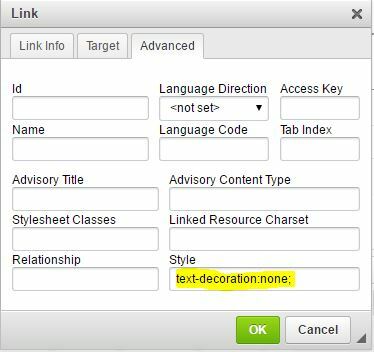 To know which all are the dynamic tags available for a campaign, click on the “[Available tags]” link right above the html editor on Campaign template page. Remember that, system will show only common tags and the ones available for the list you have selected for that campaign. The template creation page will show only common tags. 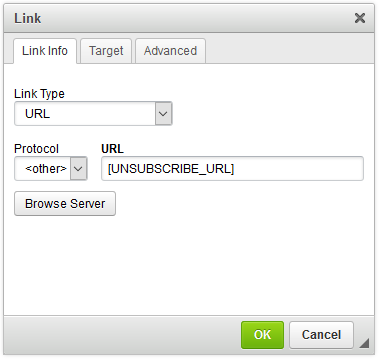 How to inscribe an unsubscribe URL ? 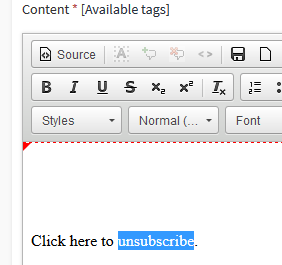 Select the text that you want to inscribe the unsubscribe link on. Click on the hyperlink button. On the new window, select “<other>” as the protocol and [UNSUBSCRIBE_URL] or [DIRECT_UNSUBSCRIBE_URL] as the URL. First URL will direct the user to Mailfed frontend for confirmation before unsubscribing but the latter will directly unsubscribe the subscriber right away when the link is clicked. If doing so breaks the HTML style of the text, then go to the Advanced tab and put “text-decoration:none;” on the “Style” field. Then click OK.